Happy New Year and best wishes to everyone for 2011 ! There is an ancient proverb which says that you get warned twice, but the third time you stand alone. On that note today is a very significant anniversary for me, because it is exactly 10 years ago to the hour when I had one of the most profound experiences of my life. Back then business was booming. My shop employed 20 people and we were working overtime in a vain effort to keep up with a huge backlog of orders. We were also preparing to break ground on a new 25,000 sq. ft shop which would have allowed the business to grow to more than double in size. My customers were begging me to expand and take on more capacity, while my bank was giving me the green light for financing. But something wasn`t feeling right. All of this extra business was not the result of any genius on my part. The market was hot and I was simply being asked to make furniture at a level that far exceeded my capacity to produce. I willingly took on all this work because I never forgot the lean times of the early 1990s, but before long I had taken on more than I could handle. I was soon overwhelmed with quotes and production schedules, cash flow projections and trouble shooting - without myself doing much of the actual work that was the rationale for being in business in the first place. Having taken on a life of its own my business was starting to race out of control. On New Year`s Day 2001 I drove up to the lot where I was planning to build in a few month`s time. It was a cold, clear and sunny day as I trudged through the powdery snow to mark off and visualize where the walls of the new shop would stand. While doing this I heard the repeated shrieks of a hawk coming from a nearby line of trees, and I decided to investigate what the fuss was about. As I approached the sound I saw first one and then a second Red Tailed Hawk fly off from a high mound of snow. As I rounded the mound I was suddenly greeted by a flurry of feathers, and I leaped back just in time to avoid a face-full of talons. Apparently a third Red Tailed Hawk had been feasting on a rabbit on the other side of the snow bank. 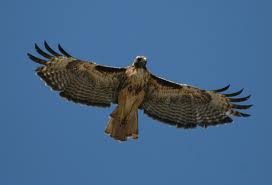 Neither he nor I had heard the other, and in its panic to flee the hawk and I had a near head-on collision. What added to the surreal feeling of that moment was the impressions of the hawk`s wings as it flapped its way up the snowbank: the imprints looked like ascending angels. Everything about this felt ominious, so I called a Native American friend who explained that a Red Tailed Hawk is considered a sacred messenger and a protector. "A messenger?" I asked "A messenger of what? Its not like he was there to deliver a FEDEX envelope." At this point the only thing I knew for certain was that I had to step back to avoid a collision. But if stepping back was the message what was it I had to step back from? I quickly realized that this was all connected to my plans to build the new shop. Fortunately I had an escape clause in my deal for the land, so I bailed and within a month purchased a smaller industrial space that I could renovate instead. As I soon discovered the timing couldn't have been better. Business softened early in 2001 and the decline accelerated with the 9/11 attacks later in the year. By the time all was said and done I ended up scaling back to what is now a seven-man shop. Had it not been for the near collision with the hawk I would probably have proceeded with the new building, creating an overhead so high that I would have eventually gone out of business. 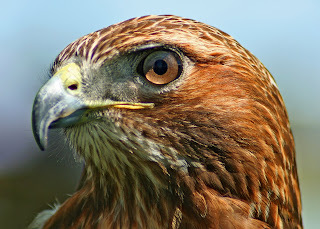 Those Red Tailed Hawks saved me and my business from a potential disaster, and for that I am eternally grateful. Labels: Red Tailed Hawk, Wiggers Custom Furniture Ltd.